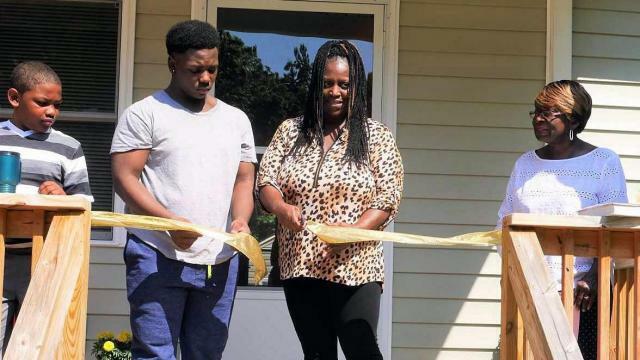 NORLINA, N.C. — Crystal Miller cut the ribbon on the porch of her new home as her “real” family and her adoptive family of Habitat for Humanity volunteers beamed. Both groups had come to this moment after long years of hard work; Miller had been approved for a Habitat home in May 2013. The May 27 dedication of the tidy three-bedroom home on a cul-de-sac off of Walker Avenue in Norlina was a declaration of independence from renting a run-down home with a kitchen floor that was caving in – a situation that got so bad that Miller and her two younger children had to move in with her mother for the past year. Crystal Miller’s new home sits on a cul-de-sac that will eventually have eight Habitat for Humanity homes built by the Warren County affiliate. Funding for the Challenge is from the State Employees Credit Union Foundation – $10 million put up to build the 100 homes, some in counties that have never had a Habitat house. Once the house is completed, the homeowner assumes the mortgage and SECU returns the funds to the affiliate so that another home can be built. In the case of the Warren County Habitat for Humanity affiliate, that home will be built on a just-cleared lot across the cul-de-sac from the Miller home. Eventually eight homes will be built there, joining the two that have been on the cul-de-sac and the eight others that this all-volunteer Habitat affiliate has completed. Bruce Rogers, president of the Warren Habitat affiliate, takes pride in his crew, which has an average age of 72. They’re retirees from all over – Ohio, New Jersey, Pennsylvania or career military folks – who have come to live the good life in the Lake Gaston and Kerr Lake communities. After a lifetime of work, they now have time for volunteer work – “something that makes you feel good about giving back.” They also have “discretionary income, grandkids and hip replacements,” Rogers quips. Crystal Miller cuts the ribbon on her new home in Norlina as friends and Warren County Habitat for Humanity volunteers look on. With her on the porch are sons Ny’Zir Miller, 10, and Kavon Davis, 14; at right is her mother, Ruth Miller. For Miller, who moved to Warren County from New Jersey in 2000, her new home gives her a foundation in the American dream of home ownership – a dream that would likely never have been realized without Habitat, which makes mortgages affordable through a combination of volunteer labor, often donated land and low- or no-interest mortgages via organizations such as the SECU Foundation. Miller’s work as a pharmacy technician, a job she has held since 1986, provides her with a steady income and the pride of work; now she has a new home and the new pride of ownership. 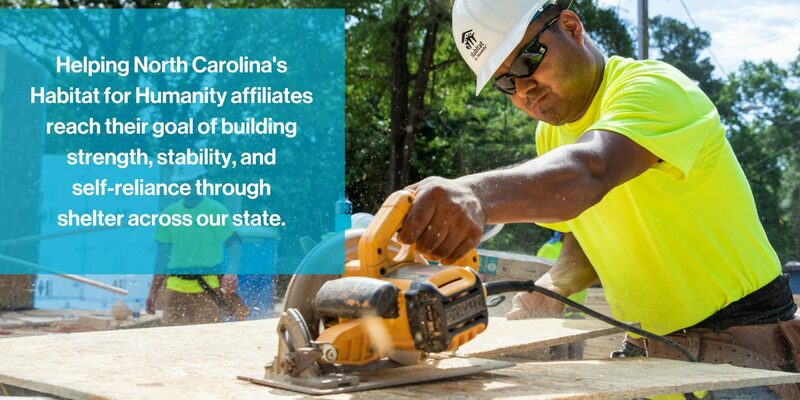 By Bill DuPre, Habitat for Humanity N.C.